Third World Solutions, fix the broken boss, chef, chiefs, and leaders and stop the American Dream. I have been self-employed 34 year of my life, and the African business model has some broken parts. The culture needs underpinning, it is self-defeating, two step forward, and two step backwards, like a dog chasing it's tale. The reality is this, an African wants to move to Europe, the USA, or any place other than Africa, he wishes to stop being called African. The dream is of migrating away. The best, the brightest, and the richest move away. It feels like I am always surrounded by African employees with the boss on vacation. It is like “Waiting for Godot.” The only person smart enough to run the business is never at the business. They have been promoted, and stop working, because no chief would lower themselve to do work. Hey you, you are not a chief, you are boss, you must continue to work, they do not get it. Yes, the boss is coming, he just never comes, we have hope and the belief in him, he is our leader, and he is a person of respect. Come back later, he will be here, but he never is, and never will be, he moved away to another continent with the promise, he is returning, and we believe him. 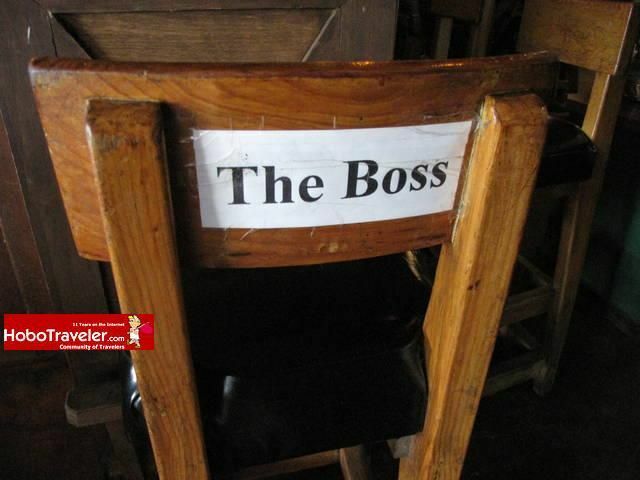 The person I respect least in an African business is the boss,(Chef or Chief) the exact opposite of the USA. In the USA the boss is a workaholic, who is always doing more than needed, more than asked, and just never stops. And, the employees in the USA are trying to avoid work, full of lofty noble reasons whey they are good workers, but only because the boss has an ear and eye on them that is American business. You are probably reading this, hiding in your office, yes or no? African earns 5 dollars per day, and spends 15, and mysteriously they having more money then they earn. American lie about how much they earn, and so do Africans, do the math it does not add up. NGO's give percentages of AIDs, for countries that have never done a census, I enjoy the comedy in process. Business needs to be simple to understand, with a boss who shows up for work, and easy to find. With simple services, and products, that people want to buy, no convincing needed. Sorry, the boss is on vacation. I can enter a Hotel, grab employees, give them orders, make them clean my room, repair furniture, and work. They behave like children happy to have the parents play with them. There is a role model for a chief, a mother, even a father, but a boss, what is that? When I become boss, I will be rich, and I will not have to work. "Will you take me to America?" Yes, they have the Amercan Dream. the interest I once had to visit. I find Asia and the old Euro Eastern Bloc more to my liking now. I also intend to see a little more of So. America and hope to get there sometime next year. But I will still keep reading your adventures in Africa. There are 2 places I would like to go in Africa but if and when are way down my lists. Egypt but not while they are having their political problems, which may last for a long time and So. Africa eventually, maybe? Yes, at first, this seems like a good idea, but generally the failure rate of Internet business ventures is about 99,999 to 1 success. I am quite sure, there is a success rate of 1 in 200 for selling on Amazon.com, and maybe a 1 in 2000 for making videos. And for sure, I can be a true expert, for a person with a brick and mortar business, who wants to to know how to boom their web site. But, for a group, it is for the most part a just a get them high, happy thing, and they would fail. One on one, I do consulting for 50 dollars per hour. Starting a business is a very personalized thing. I call you, we talk by the hour, in 15 minute chunks.